This week is one of those long weeks where I spend more time at school than at home. It's parent-teacher conference week and the 100th day of school just so happens to fall during this week too. So, I'm living one day at a time, and luckily the 100th day comes after conferences. So I'm focusing on the task at hand. With it being conferences and the month of LOVE, I wanted to share with you five things I love to do to prepare for conferences and during conferences. We all have our own way of doing things that works best for us, and I will admit that my way is a bit over the top. BUT it works for me, and that's why I continue to do it. The first thing I always do before conferences is plan. 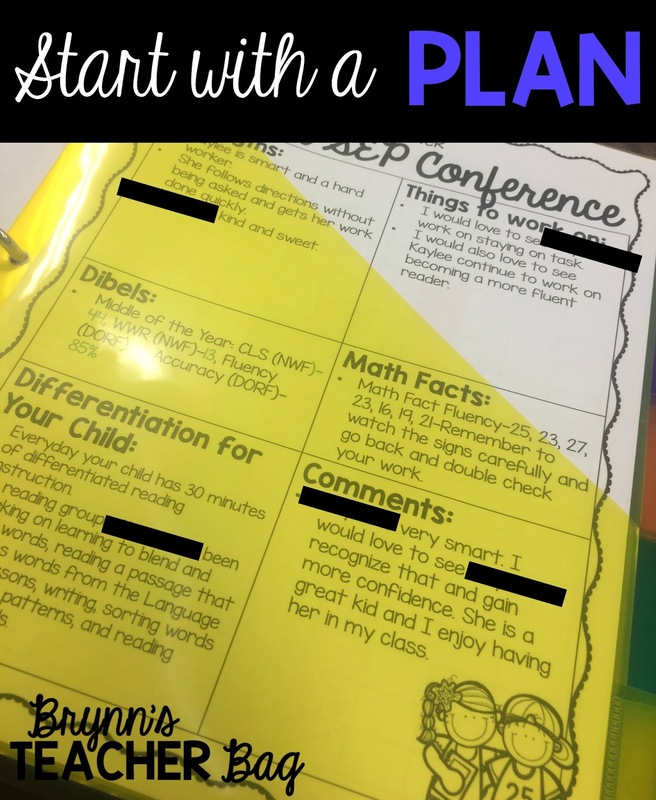 I have a created my own little planning sheet for each student. I have found that typing it up goes way quicker than writing. It also saves my hand from being a blue/black mess of ink. I make sure to think about each individual student and take some time to really reflect on what I love about them and things that I would love to see them work toward. This planning, this is key. With 26 sweet firsties, I have to have notes and my thoughts in order or my anxiety kicks in and my words are a disaster. So, that's my first tip! Plan ahead and do it in a way that works for you. The next four things are included in my planning, but I consider them completely separate. I LOVE, LOVE, LOVE to talk about my students strengths. Even those students who are on your last nerve or smacked another kid for "butting" in line, find something kind to say about them. Starting with the positive is the way to go. I know I always love to hear the good things I am doing, but also appreciate constructive criticism, which is my next focus. Talk about the negatives as "things to work on." We all have them and I'm not one to beat around the bush. I like to be open and honest with parents so they aren't blind sided when the end of the year comes. With some students it may be tricky because you have a student who does wonderfully at everything. I know you can think of something for them to work on too! Even if you have to dig deep, I know you can do it! With many of my firsties, our "things to work on" include fluency, keeping our hands to ourselves, participating more, being on time, etc. are now. It's one thing I absolutely LOVE about first grade. The kiddos make HUGE progress and it blows me away every year. It is also important to remember that even small progress is progress. I have some students who have quadrupled their words per minute and others who have increased by a few words. I tell my kids we are only in competition with ourselves. You can't compare oranges to apples. They aren't the same thing and it just doesn't work that way. We have to focus on the gains our students have made no matter how great or small. Another thing I make sure to let parents know is how I am differentiating for their child. This is mainly in reading because that is a major focus of first grade, but every parent wants you catering to the needs of their child. No matter how hard this is, I am a firm believer in changing yourself and your teaching to meet every single student's need. At our school, we as a first grade, get to divide into what we like to call "reading groups" for at least 30 minutes, four days a week. We have leveled our students, taking many factors into consideration, and made groups where we can work on sight words, blending, vowels, patterns, fluency, readers theaters, writing, and so many more things. We have found that this works like a charm. Our scores show that this is an effective practice and the kids love getting to do various activities that are catered just to them. Now I know I said I would only share five things, but I have to say that you must end the conference on a positive note. Tell something else you love about your student. Share why you enjoy having them in your class. Be positive and take the chance to dote on your kiddos. I love to see their beaming smiles as they hear the "good" things they are doing. I often joke with my kiddos that I am going to tell their parents all the bad things. Of course, I am joking, but I had one students say, "What bad things?" with a shocked look on his face. I actually quite enjoy PTC week and getting to reflect on each individual student. It may take hours of work and an entire weekend, but this is another reason why I teach. 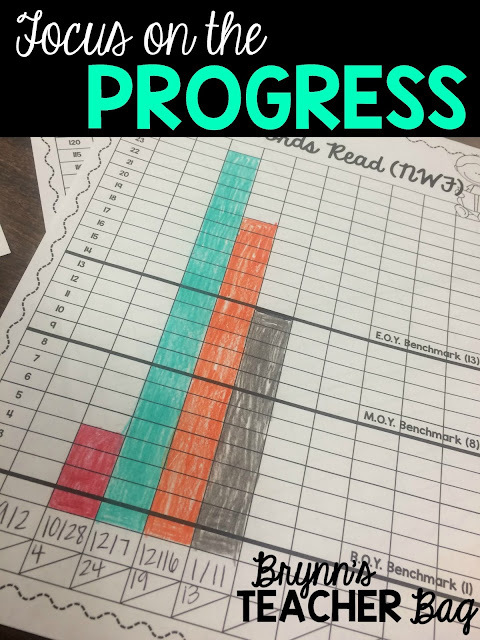 I LOVE to see the progress and helping my students gain the confidence to be the best they can be!